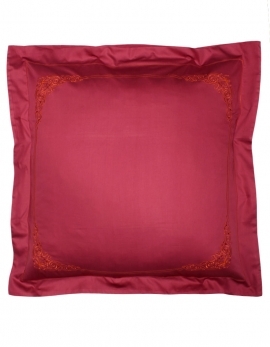 Set of bed linen 100% pure sateen of cotton long fiber, brilliant, soft, color burgundy / raspberry, embroidered with shiny orange thread. The elegance and brightness of the orange thread enlighten the raspberry sateen and produce a set of bed linen both contemporary and chic. The set of bed linen may be composed at your convenience with pillow cases, duvet cover and/or flat sheet, and fitted sheet. The duvet cover is embroidered on the front side at bout 60cm from the top border and at each bottom corners joined with an embroidered double line. 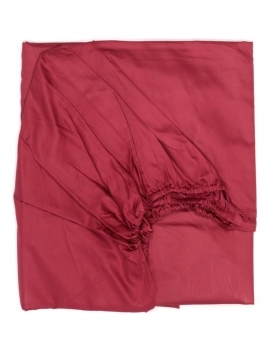 Superior grade of sateen of cotton : 380 threads per square inch - soft and brilliant aspect. Made in France. Square pillow case in sateen of cotton (380 theads er square inch), color raspberry burgundy, embroidered with brightful orange thread. The embroidery is adorning the whole border of the pillow case. French fabrication. Rectangular pillow case in sateen of cotton (380 theads er square inch), color raspberry burgundy, embroidered with brightful orange thread. The embroidery is adorning the whole border of the pillow case. French fabrication. 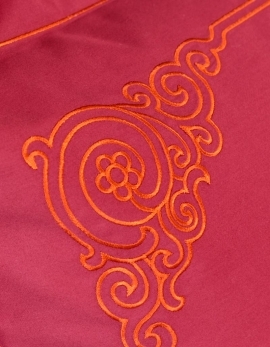 Duvet cover in satin of cotton (380TC), color raspberry burgundy, embroidered with brightful orange thread. The duvet cover is embroidered on the front side around 25 inches from the top border (to avoid that the embroidery be masked by the pillow cases) and as well at each bottom corner joined by a double embroidered line. French fabrication. 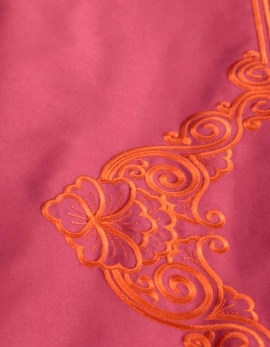 Red top sheet in luxury satin of cotton (380TC), embroidered with brightful orange. Queen size and king size available. The top sheet is embroidered on the top folded part of the sheet. Made in France.